I wish I knew about doTerra back when I was an ABA Therapist. Holy Moly, these oils could have worked some magic and I imagine that progress in our sessions may have tripled with the support of the oils I touch on below. 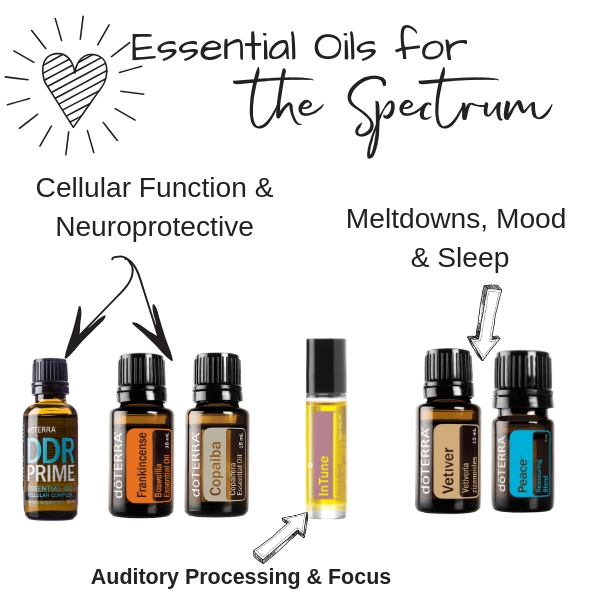 There are so many essential oils to support autism spectrum. Truly. I believe that every single parent, child and teacher may have experienced a significant positive impact from incorporating these oils into their daily routines. 1. DDR Prime- May be an incredible support where speech delay and concentration is a concern. DDR is all about supporting a healthy inflammatory response in the body, regulating immune function, supporting cognitive function, memory and repairing damaged or impaired DNA. * Combine in a roller bottle with Copaiba and apply to the soles of the feet daily. 2. In Tune- This blend is comprised of all the brain and nervous system loving oils such as Frankincense, Patchouli, Ylang Ylang and Sandalwood which are rich in Sesquiterpenes that are able to cross the blood brain barrier and nourish our central nervous system. Amyris is a an interesting oil that stimulates the brain, supports mental clarity and focus whilst reducing feelings of stress. In Tune is very grounding, encourages proper auditory and sensory processing and is excellent for promoting concentration. * Roll along the spine and base of scull as needed. 3. Copaiba- To promote a healthy inflammatory response in the body whilst calming an excited and overstimulated nervous system. Much research is currently being performed to demonstrate that cannabinoids can be used to support those on the Spectrum. Copaiba contains the cannabinoid Beta-caryophyllene (BCP) which has a very grounding and soothing response on the body useful during agitated moments and with stimming. * Can also be diffused with Peace Blend, Vetiver or Frankincense. 4. Vetiver- Mother Nature's Sleep Potion. When anxious feelings and agitation levels are peaking, Vetiver will settle and subdue. It contains around 60% sesquiterpenes so may be very beneficial for soothing the nervous system, encouraging the body back into Parasympathetic (rest and repair) state, calming heightened emotions and supporting sleep. A study conducted by Dr Terry Friedman found that the relaxing and calming properties of vetiver oil helped the children combat their ADHD and ADD symptoms, which typically include difficulty in concentrating, diminished focus, being easily distracted, difficulty with organisation and following directions, impatience, and fidgety behaviour. * Apply to soles of the feet before bed or down the spine by itself or with any of the other oils. too much vetiver can disrupt sleep or impact dreams at night. I find adding cedarwood or juniper berry to the diffuser helps at night. 5. Frankincense- For overall healthy inflammatory response, brain and immune system support. Frankincense is a tonic for the entire body which promotes healthy cellular turnover and repair, regulates and strengthens the nervous system and develops a more resilient immune system. * Can be paired with Copaiba, Vetiver or Peace in a roller bottle or diffuser. 6. Peace- The combination of oils in this blend are designed to combat feelings of overwhelm and panic. It's chemistry and aroma are very reassuring for heightened emotions. Peace encourages relaxation and may help calm and settle the nervous system and mind. * Diffuse when calming support is needed or apply on the forearms and behind ears. Peace also comes in a Touch Roller for easy topical application. Two other products worth taking the time to investigate and try would be the new Turmeric Oil for it's neuro- protective and supporting properties as well as doTerra's kids IQ Omega Liquid which contains all the essential fatty acids needed for healthy, thriving brains and immune systems! To purchase these essential oils you will need to create a custom kit. For those in the USA, these oils + wholesale membership access will come to around $308.50. I would recommend adding on the Lumo Diffuser for $84 so you use your oils both topically and aromatically. For those in Australia, these oils + wholesale membership will come to around $324.50 however this doesn't include the DDR Prime which is only available via the USA warehouse. The Lumo Diffuser can be added on for $104. A second order the following month for the DDR Prime via the US Warehouse will be needed. Follow the instructions on my Getting Started page to open your account and order your oils or send me a message and I'll help you navigate the ordering process.